DOYLESTOWN (PA) – Delaware Valley University freshman quarterback Dashawn Darden threw for 186 yards and three touchdowns, including a 92-yard scoring strike to Eric Shorter with 8:05 remaining that proved to be the difference as the 24th-ranked Aggies remained tied for first in the Middle Atlantic Conference (MAC) with a 28-21 victory over visiting Lebanon Valley College. The win was the sixth straight for DelVal as it improved to 7-1 overall and 6-1 in the conference. The Aggies are deadlocked with Albright College and Stevenson University atop the standings and have victories over both of those squads. They continue to control their own destiny with two weeks remaining as wins at Lycoming College (November 7) and at home over Widener University (November 14) would give the team the MAC championship and automatic berth to the NCAA Division III playoffs. Saturday’s loss snapped a four-game winning streak for Lebanon Valley as the Flying Dutchmen fell to 4-4 overall and 4-3 in the conference. Lebanon Valley made it a 21-21 ballgame with 8:52 remaining in the contest as quarterback Tim Pirrone hit Travis Saylor for a seven-yard touchdown. The scoring drive was set up by a 45-yard kickoff return by Michael Gaval. On the ensuing possession, a penalty against the Aggies had them start their drive at their own 17-yard line. A holding call then backed them up to the eight-yard line for a first-and-19. Darden dropped back to pass and lofted a perfect spiral to Shorter, who got behind the secondary. Shorter took it the distance to tie for the fourth-longest receiving touchdown in school history. Nick Restaino added the extra-point for a 28-21 lead just 47 seconds after the Flying Dutchmen’s score. Lebanon Valley managed one first down on its next possession, but had to punt. DelVal was able to run nearly six minutes off the clock before turning the ball over on downs and giving the Flying Dutchmen one more shot with a drive starting at its own 21 with 2:27 to go and no timeouts. They were able to reach the Aggie 34 with under a minute to play, but Pirrone then tripped over the leg of his center and hit the turf for a five-yard loss. Lebanon Valley used a lot of time before an incomplete pass stopped the clock with seven seconds left. Pirrone was looking for a Hail Mary pass, but he was sacked by Luke Boonstra before he could get the throw off and DelVal secured the victory. Lebanon Valley scored first in the game as Ryan Fink completed a 12-play, 63-yard scoring drive with a one-yard touchdown run with 5:56 left in the first quarter. The Aggies matched it with 59 seconds to go in the quarter as Armani Fuller-Williams scored from three yards out to culminate a 10-play, 68-yard drive. DelVal then went to its bag of tricks to take a 14-7 lead with exactly nine minutes left in the first half. From the Lebanon Valley 30, Darden completed a pass to tight end James Norton at the 17. Norton then lateralled the ball to Tyler Bing on the old hook-and-ladder and Bing went untouched into the end zone. Fink hit the end zone from a yard out again with 2:49 left in the half as the teams were tied at 14-14 at the break. After a scoreless third quarter, DelVal retook the lead just 2:14 into the fourth as on, third-and-goal from the 11, Darden zipped one into the end zone for Michael Jensen and the junior caught his third touchdown of the season. Saylor’s score tied the game before the Aggies took the lead for good on the bomb from Darden to Shorter. 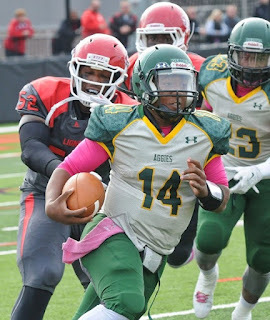 DelVal racked up 402 yards of offense and was 8-for-13 on third-down conversions. Meanwhile, the defense held the Flying Dutchmen to 262 total yards. Darden completed eight of 12 passes for the 186 yards and three scores and also rushed for a team-best 69 yards on 11 carries. Robert Cleveland added 57 yards on 10 carries. The 92-yard touchdown was the lone catch of the game for Shorter. Defensively, safety Danny Wynne had 10 tackles to lead the squad. Boonstra finished with a career-best eight tackles and the game-ending sack. Pirrone was 13-for-23 for 106 yards and one score for Lebanon Valley. Brendon Irving, the conference’s leading rusher, saw limited time in the second half due to an injury, and managed just 49 yards on 10 carries. Jon Jones had 46 yards on nine rushes. Tom Gallagher finished with nine tackles, one sack and one interception on the defensive side of the ball.